Whichever search engine you use, if you go there now and type in ‘’what is my IP”, you will get your address in large numbers. That is when you know that there is an IP address tracker on every search engine, on all platforms, and in all cookies. There is nothing strange or illegal about this, as it is the official and public address of your modem on the internet. But, the fact that it is not uncommon doesn’t mean that it is a good thing. You wouldn’t want your house address to be open for everyone on the internet to see, and concealing your IP address should be done for the same reason. There are several ways to protect yourself from your IP being used for malicious purposes, and some are better than others. There is a way to block your modem from sending out your IP, but this will prevent you from accessing many online services. Also, it will make you stick out like a sore thumb. A much better option is to mask your IP with a good VPN provider. Premium VPN providers like Le VPN give you dozens of servers to choose from, situated in 114 countries worldwide. This way, you will still be visible as having an address, but anyone wanting to misuse it will just be attaching an impenetrable VPN server halfway across the world. When Is Your IP Address Used? Your Internet Protocol Address, or IP address, is the label given by your modem when it is communicating with the internet. Every other modem, meaning every other computer connected to the internet, sees that address and sends all of the data you have requested. In the old days, when personal computers were not so common, and individual hacking even less so, this didn’t seem like a problem. Now, it is definitely a problem. Every website you access sees your IP and makes a record of it. This record keeping doesn’t need to be anything malicious, as it is mostly used for future proof that your device is safe and not trying anything bad. But, if someone hacks that website, they will have access to your IP and can engage in IP address tracking. In the wrong hands, there is a lot of things that can be done with a person’s IP, especially if the hacker has some additional data as well. While it is possible to remove your IP address by tinkering with your modem, this will just result in losing internet connection. You will technically still be connected, just unable to receive any information, which is basically the same as being disconnected. The best analog to this is removing your home address from all records and expecting to get mail delivered. The request will be sent, but never delivered. Also, there are options to block others from seeing your IP address in plain text, but this doesn’t actually prevent their device from seeing the data, just the user. In cases where you are communicating with a website that is already infected with malware or operated by hackers, you will not be safe. Each ISP (Internet Service Provider) will have their own rules when it comes to assigning IP addresses, as well as some instructions from the government how they should go about this. In some cases, your ISP will provide you with a dynamic address that will change every time your modem reconnects and the system will assign you one of the addresses from the pool. Most times your modem will have a static IP address and will always use the same one. This way the ISP can also track what websites you are visiting and have some control over your internet access. While not all ISPs will have an IP address tracker, some will, and it is disputable if your private information is safe in these cases. While no ISP will share their info with any hackers, they will share it with the governments, and it is up to you to decide if that is something you have a problem with or not. Is Every IP Address Tracker Malicious? Although all IP trackers can be used for malicious purposes, the original reason why they are there is usually not malicious. In most cases, apps and websites will use a tracker to use your IP geolocation to provide better services. For instance, if you are accessing Youtube from a German IP address, you will see the most popular videos in Germany. When you are using a good VPN, this tracking can be used to your advantage. By using the Le VPN app, you can switch your server to another country like France, Germany, or Spain. That way you will see all of the tailored services for that location. Finally, VPN internet privacy is the most secure system available, which is the main reason why you should consider it. Downsides of having your IP out in the ether are quite obvious, and very similar to having your home address up online. First of all, having this info out there endangers your personal security as well as your cybersecurity. Even without having any other information aside from your IP, a hacker or an unscrupulous company can see your city, your language, as well as the way you are connecting. They might see that you are using iPhone Safari to browse the web and send some tailored phishing content your way to hook you up and steal the rest of your data. They can also keep a record of your IP until they can find some other information or hack your ISP. Hacking ISPs is not done with a computer, but with a phone call. Someone can call your ISP and say that they are experiencing issues with their connection and ask for a team. Then, they will ask for the support to confirm the address, giving your home address and name. Finally, leaving your IP public and traceable can damage your devices and disclose your location to hackers and criminals. That way, your mobile device might be affected, transferring the virus or spyware to your home devices, creating further issues. Your personal information is the first thing you should be cautious of when on the internet. While you might think that there is nothing that your data can be used for, you will be astounded how many crimes can be committed with just a few pieces of data. First of all, your info can be used for identity theft. A hacker can use your IP to find out your address, as well as access your devices. Once they have access to your banking details or your social security number, they can make a double and start misusing your identity to cash in on your good name, or even commit crime leaving you out to take the fall. Additionally, your personal information can be used to scam your friends, co-workers, and other connections. As they know that these people will trust you, they will send malware to them pretending to be you, damaging your reputation. Finally, your personal information can be used together with IP tracking to steal both from your bank account and even your home. While this is something related more to businesses than to individual internet users, IP spamming can happen to anyone that is targeted. It works by creating a bunch of programs that are all made to send useless, empty, or even malicious data to your IP address. While this can’t damage your devices or access your data on its own, it can make you unable to use the internet properly. Also, your IP address can be hijacked and used as a spamming waypoint, placing you on a spammer list and disabling your access to multiple services. Having your IP address gives away the ISP that provides it. Like most people, you are probably paying monthly or weekly bills to your ISP for that internet connection and using your name, address, or maybe even credit card information. This means that a hacker can use your IP to match it with a bill paid to that ISP, finding out your name, as well as many other data points. Having your IP public opens you out for targeted attacks. In most cases, you will be noticed by some hacker or criminal group, either because of your social media posts or by making your shopping lists public. As they already have your name and the IP of the device that made the posts, they believe that it will be very easy to track down your other information and DOX you. And, if you are not using a VPN, it is very easy. They just need to use an IP address lookup, and they will see much of your info right there. An IP lookup tool is even free and accessible online. The least troublesome but most annoying issue when having any IP on any device public is that you are opening yourself to spamming and malware. It will just be added to a list and used to send any information, at any possible time, to your IP. If you ever wondered: ‘’why am I getting this message I never signed up to get”, it is probably because your IP is public and you are on some sort of list. As previously mentioned, one of the steps in hacking your bank account is finding out your home address. This alone can be quite a problem as it may give burglars and other criminals a general idea if there is any security in your home and if you are sometimes out of the house. They can even follow you on social media and wait until you tell them that you are out, using that time to break into your home and take anything of value. This can become an even bigger issue if you were targeted and posted pictures, making a burglar come into your home, which often leads to violence. Aside from your personal safety and information, there are also dangers that will impact your devices, even if you never experience any problems on your person. This can end up in stealing your content, your data, your information, but can also be used to hijack your devices to do other things. The real issues with any IP address tracker are when they are following your mobile devices, as that is basically telling everyone your exact situation at the moment. Conspiracy theorists have long argued that the government is going to install chips in us and track us wherever we go. This didn’t happen (yet), but we are instead buying these chips for a lot of money to carry them in our phones willingly. Triangulation is an incorrect term in this case, as it is a remnant from the time where you needed to hack three reception towers to get an approximate location of a mobile phone user. Now, with mobile data, there is literally a satellite in orbit tracking your phone to a radius of about 3 feet. If criminals know your geographical location and when there is a long list of issues you may have, anything from burglary to kidnapping is on the table as you are announcing to everyone what is your current location. Unlike desktops and laptops that usually run some sort of firewall bundled with the operating system, mobile devices are much more susceptible to attacks. With their IP address visible, mobile devices can receive ‘’push notifications” that will have some tracking software in them, compromising your device. Especially for faster and newer phones, you might not even experience a slowdown of the machine, which will be running monitoring apps. This way a criminal will not only have your information at their disposal but will even be able to see your screen, surpassing things like P2P encryptions which they otherwise wouldn’t be able to do. Same as with malware sent to you over your email, your connected device can be spammed and bombarded with malicious software, as well as just bloatware. Even if you have an anti-virus, this will use your device’s resources, making them slower, less responsive, and using their battery faster. While this is not dangerous even with average levels of cybersecurity, it is bothersome and annoying. Thankfully, it is not that hard to stop your IP address from being tracked. But, while most of the solutions will solve some of the issues, only a few are really good at concealing your local IP from showing on other people’s screens. Most network providers will give each client an option to protect their privacy by making their IP address hidden from other users. This is not a good solution as it will block your from most services while still leaving your IP visible for those who are really after them. Some ISP providers might have an option to encrypt this data from anyone looking, but this will still not change your IP when communicating with websites. Masking your IP address is a much better option if you want to browse the web uninterrupted. There are several options you can use, which will differ in efficiency. First of all, there are proxy servers and proxy connections that will allow one app or one device to connect to the internet over that server. This might be a good option if you know who is the owner of that server and trust in their ability not to be hacked themselves. If it is an unknown free proxy with no previous reputation, your privacy and anonymity are not guaranteed. Second, you can use a TOR browser that will jump your connection through other users and thus conceal your own online presence in the forest of other people surfing. This solution reduces the chances of your local network getting compromised significantly, but not to zero. 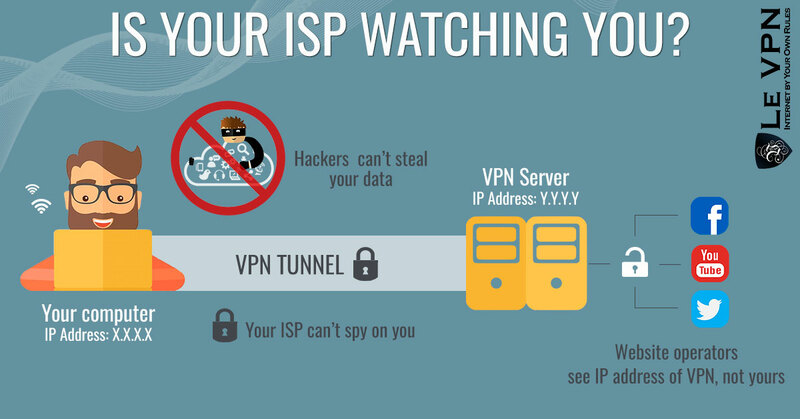 The only sure way that will mask IP address and make you secure and anonymous online is to use a VPN service that will change the IP that the public sees with an IP of the server you choose. This type of service will completely hide your external IP and place a shield between you and anything bad online. A virtual private network is not only a proxy, but has multiple other advantages as well, all in the effort to protect your devices. It is impossible to go online without an IP address, but that doesn’t mean that you need to tolerate an IP address tracker or an IP tracer following you everywhere you go, sending both your personal information and your location information to the internet. There are several ways to protect yourself, none better than using a good and reliable VPN. Professional VPN providers like Le VPN will also give you other tools to defend yourself, not only the basic ones that will help you hide. This way, you can connect to the internet without fear, or feeling that someone is looking over your shoulder.